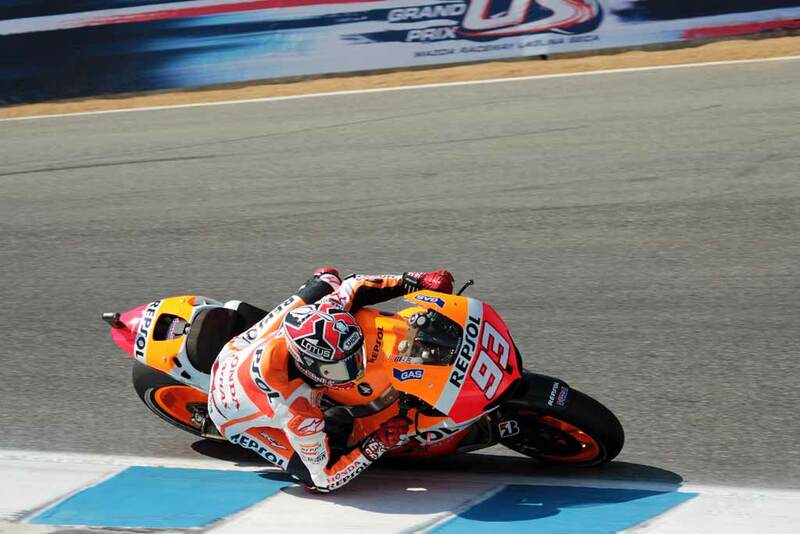 Marc Marquez faces arguably his biggest challenge yet in 2014 in trying to retain the MotoGP championship. The Spaniard will be aiming to become the first rider since Valentino Rossi in 2009 to successfully defend the premier class title. It’s a challenge that not even the uber-consistent Jorge Lorenzo and the other worldly talented Casey Stoner have been unable to achieve. Last year Marquez came into the premier class on a wave of expectation with his Moto2 heroics having made it clear that he was a rider not to be trifled with. Even so his immediate success came as a surprise to the paddock who expected his undoubted speed to be punctuated by mistakes and inconstancy. There were mistakes, as attested by his numerous practice and qualifying crashes, but 16 podiums from 18 races showed that when it mattered on Sunday he could iron out potential mistakes and marry his speed with strong race craft. 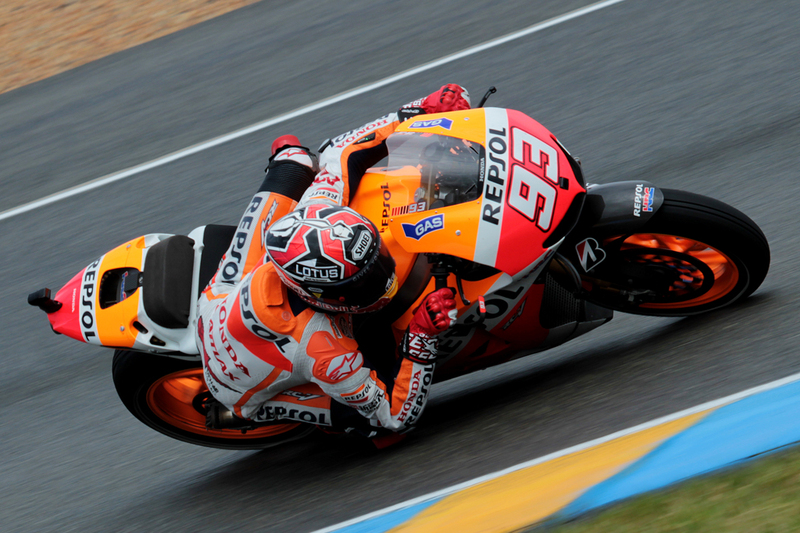 His unique riding style, with ever increasing lean angles, and his aggression made Marquez an instant fan favourite with the red number 93 flags selling in huge numbers at every circuit and Marquez quickly became the sports new star and a hero to millions. His rookie season could be encapsulated in his opening three races. In the season opener at Qatar he finished on the podium after a combative race which saw him fight his way onto the rostrum after fighting with Rossi. 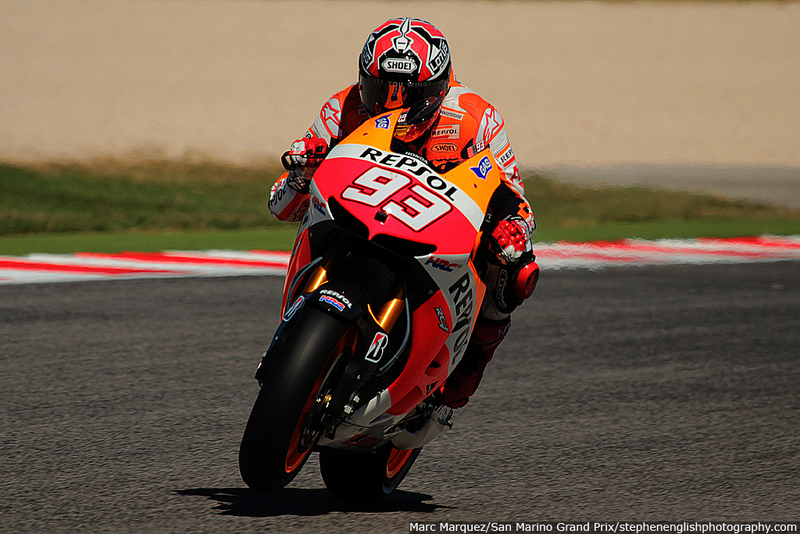 A maiden victory followed in Texas from pole position before travelling home to the Spanish Grand Prix and clashing with Lorenzo in their battle to finish second. 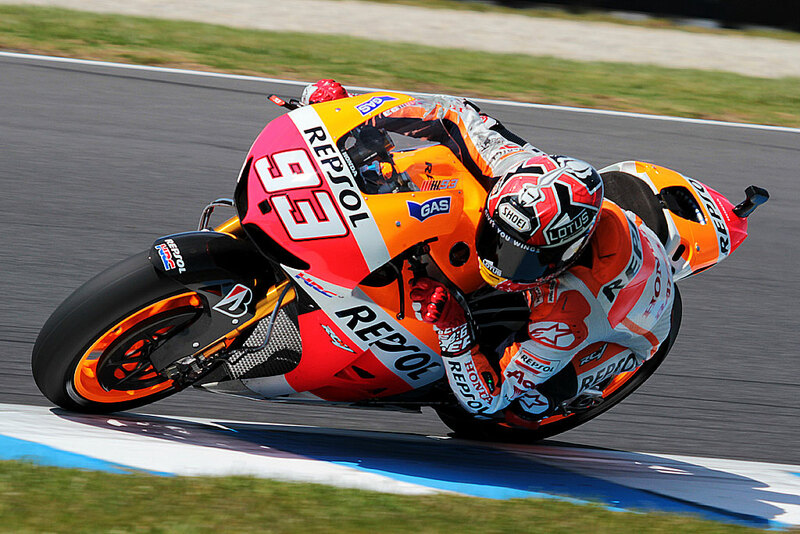 His ability to immediately get down to pace was impressive but his mentality of racing against the likes of Lorenzo, Pedrosa and Rossi showed his mental strength and this ability is what gives hope that he could join the elite list of repeat champions in the premier class. 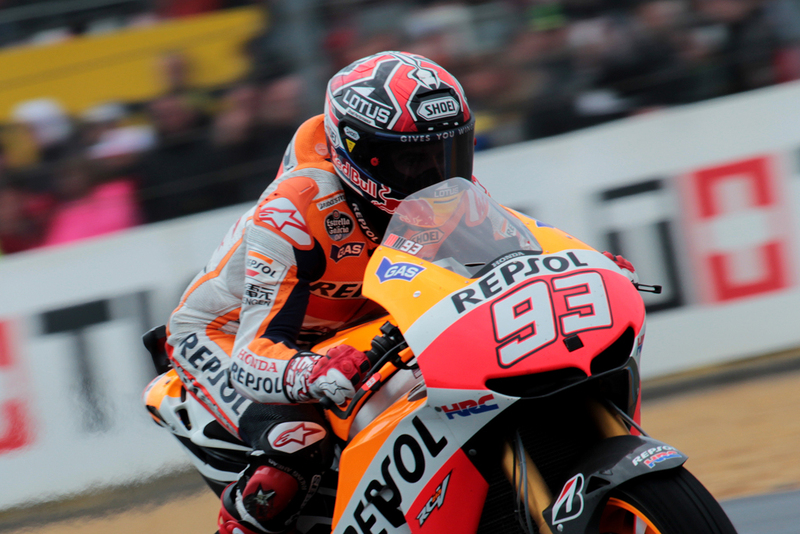 If Marquez can retain the title he will join Rossi, Mick Doohan, Wayne Rainey, Eddie Lawson, Kenny Roberts, Barry Sheene, Giacomo Agostini, Mike Hailwood, John Surtees and Geoff Duke as the only riders to win consecutive titles. Given the list of riders unable to retain titles the challenge facing Marquez is not to be underestimated but there are precious few paddock sages willing to bet against the recently turned 21 year old. History is littered with examples in all walks of life of people unable to follow up a successful debut with sustained success. Whether it’s in music and the one hit wonders, the Greek national team’s success at the 2004 European Championship or golfers who claim a solitary major title there are lots of examples of people incapable of ever reaching the heights of success again. 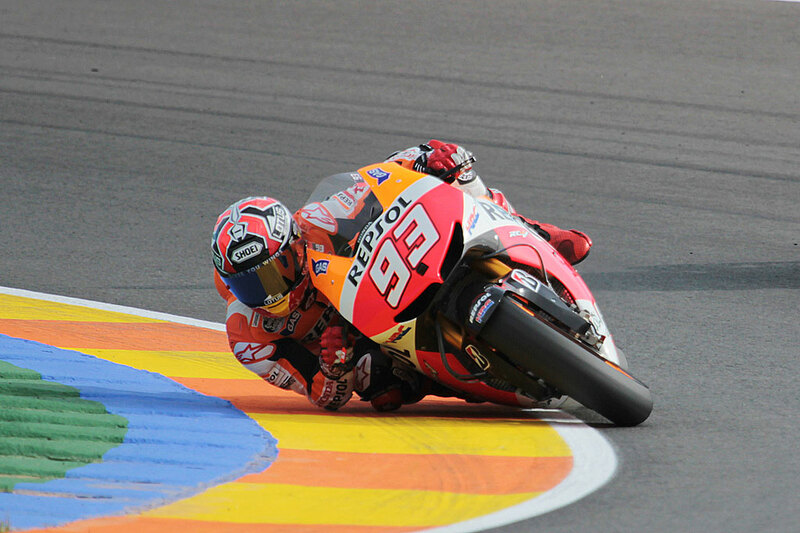 Winning 125, Moto2 and now MotoGP titles shows that Marquez has the mentality to set lofty goals and strive to improve. The challenge of backing up his initial success in the premier class with sustained dominance is the one facing Marquez now. 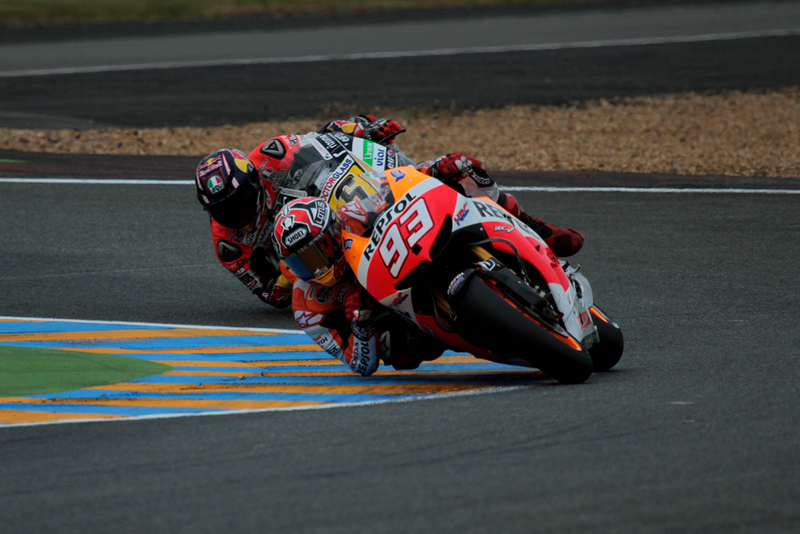 Looking ahead to the coming season it appears that Marquez and Honda should once again be in a position to win. With 21 litres of fuel the Honda was consistently more economic than its rivals and with one litre less of fuel available in races this year that advantage will be even greater in 2014. The plight of fuel economy has hurt Yamaha since the introduction of the 1000cc regulations with numerous examples of bikes running out of fuel on the slowing down lap or, in the case of Cal Crutchlow at Motegi in 2012, on the final lap of the race. Apart from the reduction in fuel there are also restrictions in place for electronics and a change of tyre compounds. While the introduction of the Dorna spec software for the “Open Class” has been gathering most of the headlines it should also be noted that Magnetti Marelli Electronic Control Units will be fitted to all bikes in the class. The move has been met with hostility from the manufacturers and the only compromise that was found was that factory outfits could still develop software but would be limited to spec hardware. While the software can be freely developed by teams limiting the hardware has numerous impacts. Dorna could instigate a change to the Magnetti Marelli ECU and limit the number of channels available to the engine management software and force teams to reduce the complexity of their software algorithms. The change in regulations is the first step that Dorna has taken to curb the assent of electronic sophistication in the premier class and allow for them to have a greater control on the product offered on track. Since the introduction of the 800cc regulations the importance of electronics has become hugely important to the overall package of a MotoGP bike and manufacturers have used racing to develop ideas for introduction to their road bikes. Whether it be traction control, ride by wire or anti-wheelie control the developments have allowed for manufacturers to slash development time in the factory for electronics on road bikes. 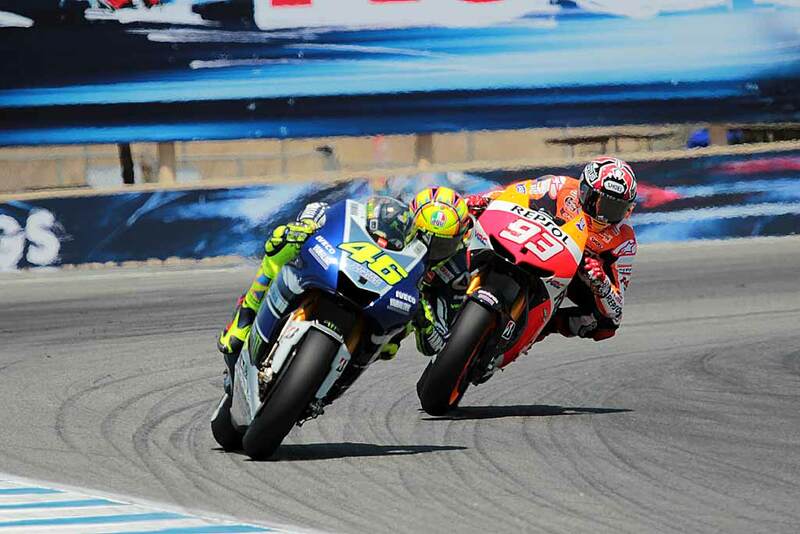 As a result Honda and Yamaha are aghast at the prospect of racing in the premier class with a spec software package. Dorna will instead give Factory outfits the option to race with their own software but at the expense of having to use less fuel, less engines and harder rubber than the Open teams. 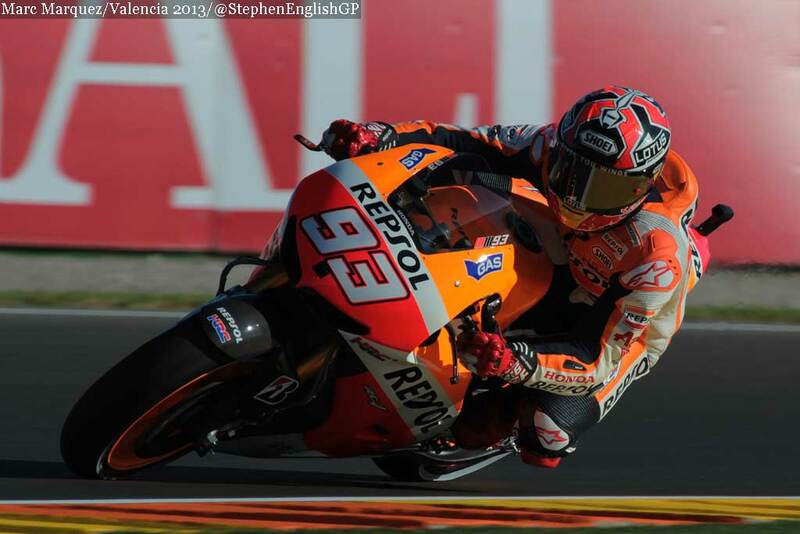 While the season is coming up fast for the MotoGP field Marquez spent time over the winter enjoying his success. For any world class athlete there is little downtime between campaigns and little off-season. MotoGP probably has the shortest off-season with the riders finishing the race just before 3pm on Sunday and the first test of the season starting the next day! “Valencia only seems like yesterday! If I’m honest, sometimes it still feels like a dream and like it didn’t really happen. My town of Cervera hosted a big party for me after Valencia and that was something special, to see the whole town there celebrating. I’ll never forget it! 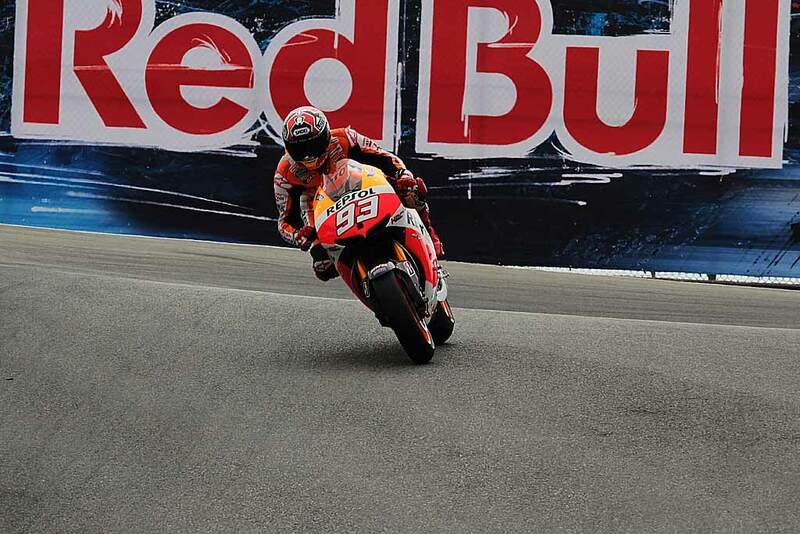 Riding motorbikes is something that Marquez did better than anyone last year but continuing to grow and develop as a rider will be needed if he is join the elite list of repeat champions in the premier class. 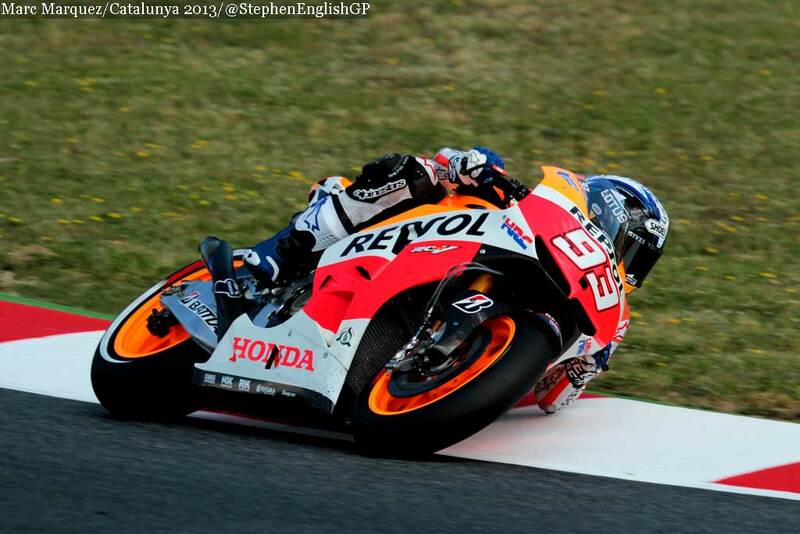 This entry was posted in Analysis, MotoGP and tagged Marc Marquez, MotoGP, Repsol Honda. Bookmark the permalink.